Shokugeki no Soma (aka Food Wars) caught my eye when I was flipping through the Viz Media spinner at Barnes and Noble a couple of weeks back. Now if you’re a friend of mine you know that I have an unhealthy obsession with food based anime and manga. Yakitate! Japan, Ben-To… So when I found all three available copies on the spinner with a Buy 2 Get 1 Free there was no way I could pass them up. Soma trains in his father’s small neighbourhood restaurant for the day he can finally beat his old man in a cook off. So far Soma has yet to beat him even once, but his efforts aren’t wasted as he still has an abundance of talent. Soma’s skills even save the restaurant from a developer looking to bulldoze the building to put up a new skyrise. But soon afterwards Soma’s dad announces he’s closing up the shop to go work with a friend for a while and tells Soma he should spend the next three years at culinary school. It’s not just any old cooking school with kindly old ladies teaching the basics like Soma expects; Totsuki Saryo Culinary Institute is one of the premiere cooking schools with students from all over the globe competing daily to remain in the program. Teachers fail students on the smallest of whims and only the top 10 percent of students manage to graduate at all. But those who do are prominent chefs with stellar restaurants and hotel chains in their control. 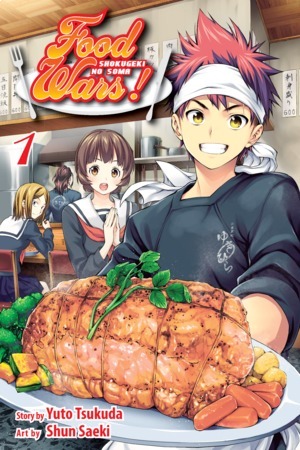 Everything with Totsuki seems to revolve around intense battles called Shokugeki. New applicants must pass one to transfer into the school, and Soma also has to deal with one just so he can move into the Polaris dormitory, where he finds himself living with an eclectic assortment of school mates and a house mother to rival them all. And there is no shortage of people hoping to take Soma down, especially after his speech in front of the entire school at the beginning of the year. Particularly Erina, granddaughter of the school’s chairman. She’s already failed him on his entrance exam and has no idea who gave him a second chance (her grandfather). Armed with money and a posse of well trained classmates, Erina is determined to make Soma’s time at Totsuki come to an end sooner than later. If only she knew who is father was…. 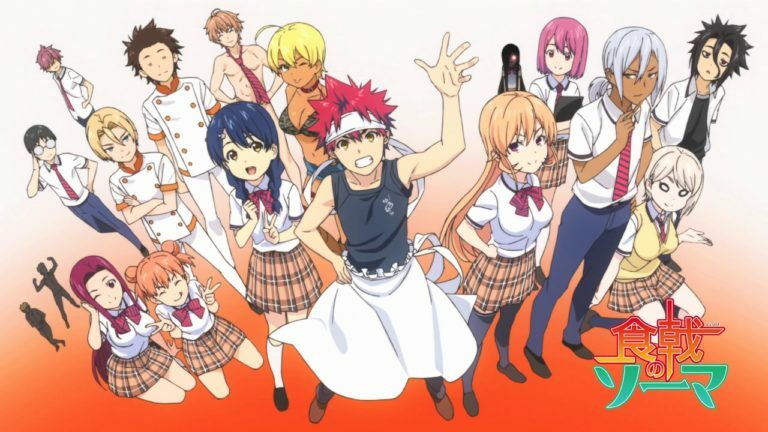 Shokugeki no Soma is geared for the 16 and up crowd as there are several suggestive scenes revolving around the food created in the story, as well as the semi-inappropriate things that can happen when teenagers are sent off to boarding school. Each volume also contains recipes for some of the meals presented within although I have yet to attempt recreating any of them. 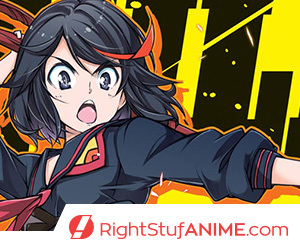 You can find the first 4 volumes on RightStuf: Volume 1, Volume 2, Volume 3, Volume 4 or via Amazon.